Detectives are looking for two men they believe could shed light on the hours leading to the death of a woman identified as Mary Wambui Kori in Nairobi on Saturday in a suspected crime of passion. The two men shared a meal at Homeland Inn on Thika Road with the victim, Mary Wambui, and Judy Wangui, a suspect who is in police custody. This comes as a new woman who claims to be Joseph Kori’s first wife came out with new details. The woman identified as Grace Wanjiku says that Kori loves hard and could never hurt the people he was in love with. Wanjiku revealed the suspect, Kori was a good man who had even paid her dowry and together were leading a good life as husband and wife in Kayole, Nairobi before he neglected her and their daughter. 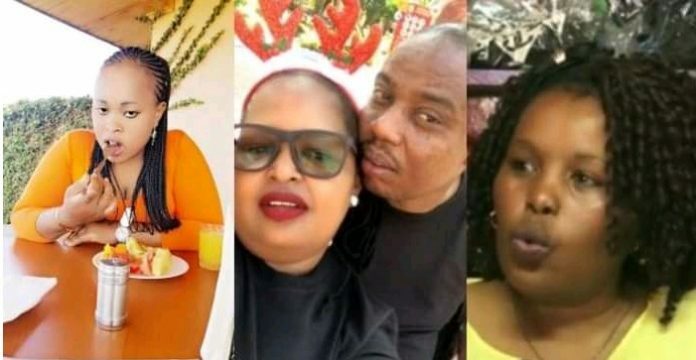 According to Wanjiku who parted ways with Kori a couple of years ago, the suspect started his philandering way after landing a government tender that supplied him with tonnes of money. ”We had nothing but we loved each other, we lived in a single room which we used to pay Sh. 1,500. He started making good money and we moved to a bigger house.” Wanjiku said. It is then when he stopped coming home, a move that led her to investigate only to find out he was in a relationship with the deceased Mary Wambui Kamangara. Wanjiku sensationally accused the deceased of snatching Kori from him. ”Someone sent me two numbers and told me this is the woman who is currently with your man Mary. I called Mary and asked her about it but my hubby got mad and asked me to apologise to her since she was his business associate, I called and apologised but I was hurting a lot.” Wanjiku said. Wanjiku says that as much as she is separated from her hubby, she believes he is innocent as he could not even hurt a fly during their time together. ”Joseph Kori is my husband because he paid my dowry and we cannot change that. He betrayed me yes but he is still my husband and he has never laid a hand on me. I don’t understand how he is mixed up in the ongoing murder case. He loves too hard.” Wanjiku said. Meanwhile, the police have recovered Wambui’s white Mercedes Benz. The car was discovered in Githunguri, two days after her body was found dumped in a dam in Juja. The white Mercedes Benz C200 was found in Kwamaiko and taken to Ngewa Police Station. Police believe the vehicle was used by her husband, Joseph Kori and his lover Judy Wangui, to transport Mary Wambui Kamangara’s body on Saturday night. Police said they have evidence showing that Mary was killed by the two inside Wangui’s house at Fourways Junction on Kiambu Road. Police say Wangui lured Mary to her house where they found Kori and its thought a scuffle ensued leading to the killing. The two, according to police, then wrapped her body in a gunny bag and attempted to hire a taxi but the driver backed out on learning their mission. It was then that they loaded the body onto her Mercedes Benz and transported it to a dam in Juja where they dumped it and fled. The body was recovered the following day, during which her husband was arrested while loitering around the scene, claiming he was also looking for her having learnt from social media that a body had been spotted there. It is then that he took them to his lover’s house at Fourways, where she was also arrested after police found bloodstains.